Edie and Andy: Edie and Andy on TV!! Well hello my dear darling readers! I'm beaming to you from my favorite place - the television! In true Andy Warhol fashion, I have achieved my 15 minutes of fame!! 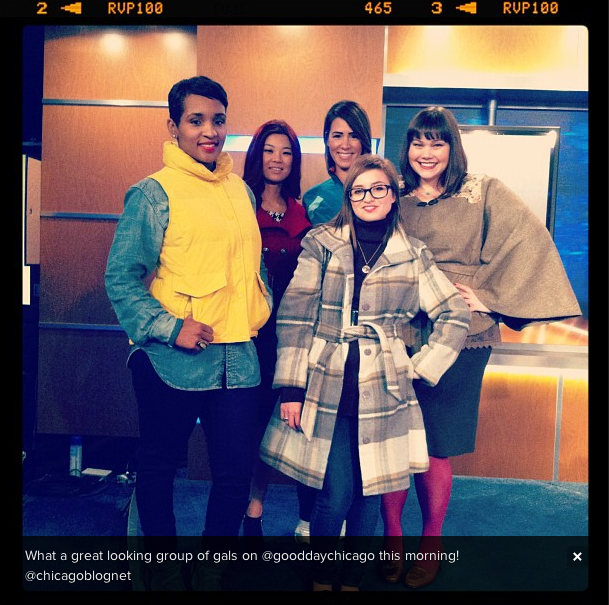 This morning, a gaggle of gorgeous bloggers from the Chicago Blogger Network were graciously invited to the set of Good Day Chicago to model a selection of fall outerwear styled by the lovely Jen Luby of You Know You Love Fashion. My fellow model bloggers and I were each styled in a different and distinct look - I was casual weekend chic, a gal who spends her weekends noshing on brunch and perusing the farmer's markets (so true!!). They styled me in a belted plaid trench from the Burlington Coat Factory - and the timing couldn't have been more perfect with the temperature's dropping in Chicago, and a new BCF location opening just minutes from my office in the Loop on State Street! Prior to airing, I arrived at the studio early enough to befriend Lauren of LDOTCDOT.COM, where we were graced by the presence of two of the Wayans Brothers! That's right, us bloggers weren't the only VIPs on set. Naturally, we geeked out over the celebs AND managed to take pictures of ourselves in the mirror of the studio. The rest of the gals, ahem, models arrived and, after excited introductions, we suited up, toured the studio, prepped, and took a bunch of pictures!! From left clockwise: Autumn of Sir and Madame, Lauren of LDOTCDOT, Mari of Sportsanista, and Amber of Style Plus Curves, and ME!! We were marched out to the studio space, bundled up in our wonderful attire, and given directions for the segment. The camera guy Gary told me I looked great! And then, with almost no warning at all, we were rolling! It was surreal, strange, and fantastic. I think everyone should try being on live television at least once in their lives!! Was I nervous? YES. Was it fun? ABSOLUTELY!! And the best part of it was that I met some wonderful local bloggers through this strange and exciting event. I truly will never forget this. And now ladies and gentleman, drumroll please... here is a the taping of the LIVE TV SEGMENT!! I just want to extend a big warm glowing THANK YOU to Jill and Kellen of the Chicago Blogger Network for offering me and my fellow bloggers this fantastic opportunity. It truly was unforgettable. And thank you Jen for coordinating and styling! We couldn't have done this without you!! YOU ARE TOO FANTASTIC FOR WORDS. awesome. soooooooooooooo awesome!!!!!!!!!! you are amazing, sandy! awwww thanks lexie!! it was so fun!